You’ll be hard pressed to find a child that doesn’t enjoy bike rides. It’s the coolest and the most accessible way to travel. More often than not, this love of cycling continues into their mature years. It’s a fun way to stay healthy. Even though your children and you enjoy cycling for different reasons, you can double down on this hobby and turn it into a holiday activity. If you want to go travelling with your children, there is no better way to strengthen the bonds than interesting bike trails for the entire family. Prince Edward Island is the smallest province in Canada. If you take only a short glance at it, you’ll notice it’s a perfect playground for fun family activities and cycling. The location is flat and renowned for its fresh produce. Furthermore, motor vehicles are banned on the island. Have you ever wanted to show your children the home of Anne of Green Gables? You can take them on the 470-km long Confederation Trail that cuts through the heart of the island. Don’t forget to drive around Basin Head and enjoy the sight of the expansive sand dunes in the Prince Edward Island National Park. If you decide to stay on the island to enjoy every aspect of its biking potential, rent rooms in one of the best hotels the location can offer – the Inn at Saint Peters – every room offers a view of the bay and the restaurant food is renowned for being absolutely amazing. If your children are over 10, hop on a plane ride to Cuba. After you’ve landed, take 2 weeks to enjoy every aspect of Viñales, the adventure capital of Cuba which stands as a gateway to the Sierra de los Organos mountains. The fact that this region has not become so deservingly popular makes it a perfect opportunity for a family that wants to enjoy a quaint cycling holiday. There’s a rustic, rugged charm to the region that just can’t be compared to anything else. Make sure to stop at the restaurant named “Balcony of the Valley”. It overlooks tobacco fields, vintage houses and rocky, green landscapes in a way that will leave your fidgety children gob-smacked. Jordan hides one of the best family-friendly bike routes in the world. The road from Mount Nebo to the Dead Sea runs for nearly 30 km, and it’s downhill all the way, really easy for children to navigate without spending too much energy under the scorching desert sun. Just make sure everyone is wearing caps and sunglasses. Every member of the family needs to apply sunscreen to the sensitive areas like the shoulders, neck and back before you embark on this journey. The plains you’ll drive through are a spectacular sight and the Dead Sea, the lowest place on earth, is one of those regions that glow in ancient wonder. It’s an adventure your kids will remember for a lifetime. The land down under offers an incredible variety of landscapes. Naturally, people have blazed bicycle trails through some of these sights for the sake of everyone’s enjoyment. As far as family-friendly bike trails go, the one cutting through Kings Park, in the vicinity of Perth, Wester Australia, might be the perfect pick of the litter. The twisting bike paths will lead you through dense greenery and man-made botanical gardens. You can always stop to marvel at amazing city views and natural landscapes. It’s not a particularly challenging route. If you or your younger family members are not in top-form, the Bosch eBike system offers a variety of options and it is very popular on the Australian continent. The Red River District of Hanoi, the capital of Vietnam, is the only region of this urban area that was untouched by the war. The streets are quiet and charming, and it’s twisting passages filled with people make it a perfect location for bike riding. The amalgamation of architectural designs that draw influence from Southeast Asian, Chinese and French cultures is captivating, and the entire family is bound to enjoy it. 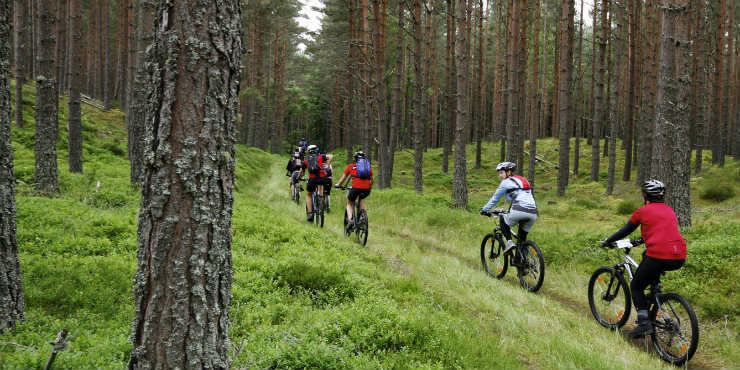 By no means are any of these bike rides leisurely and they are not supposed to be – this is meant to be a rollicking adventure for the entire family. However, all of the above-mentioned parts of the world are quite safe and you won’t have to look over your shoulder for any excessive dangers throughout the trip. Just make sure everyone is properly hydrated and well fed, and this should be a holiday to remember.